How to carry your camera while traveling is a perennial problem for travel photographers. Traditional camera straps are less than ideal — they’re often uncomfortable, leave your camera swinging precariously (rather than secured to your body somehow) every time you bend over, and easy for thieves to slice and swipe. Spider‘s brand of camera holsters, straps, and harnesses remedy this problem. They’re designed to secure your camera tightly to your body, whether on your belt or backpack strap. They were kind enough to send us a sample of the SpiderLight Backpacker Kit to check out. … to securely attach a SpiderLight Holster and select GoPro accessories to a backpack strap or messenger bag strap. The quick snap-in connection fastens the SpiderLight Adapter to your bag’s strap. And the ergonomic adapter shape works with the body’s natural contours for optimal carrying. The adapter pad employs elastic band wraps around the camera lens to prevent camera movement when walking or hiking. The SpiderLight Backpacker Kit is among Spider’s most versatile camera harness kits. It includes a holster, a plate, and a pin — all allowing the traveling photographer to secure their camera just about anywhere on their person. The smartly designed pin mounts to the tripod mount of most any DSLR with near-universal compatibility. This forms the “male” end. On the other “female” end, the holster and pad provide a place to clip the pin into. Securing your camera to your person is a simple matter of sliding the pin into the holster where it clicks neatly into place. The camera can be quickly released by grabbing the camera body with one hand and swiping the holster “safety switch” to unlock it. The heavy duty metal and plastic construction feels extremely durable and well-designed. Even with my relatively heavy Nikon d610 and a medium zoom lens, the body remains securely in place on my backpack strap with little movement or swing. An included pad and Velcro elastic strap help keep it firmly and — most importantly — comfortably in place. Out of the box, the SpiderLight Backpaker Kit is also designed to be used with GoPro cameras. By simply removing the standard metal SpiderLight holster (used for your DSLR camera) and swapping it for the included GoPro compatibility clip, you’re GoPro can be quickly and easily mounted for capturing POV footage while biking, hiking, or just traveling. Spider’s SpiderLight line is best for mid-sized DSLR cameras. However, Spider’s long list of additional gear provides for versatility no matter what camera you’re trying to mount or where. For larger DSLRs, their SpiderPro line is perfect for even the bulkiest, heaviest cameras. For lightweight point-and-shoot cameras, the compact Black Widow series is best. The SpiderMonkey series also includes purpose-built clips for additional gear and accessories like flashes, light meters, battery packs, water bottles, and rain covers. 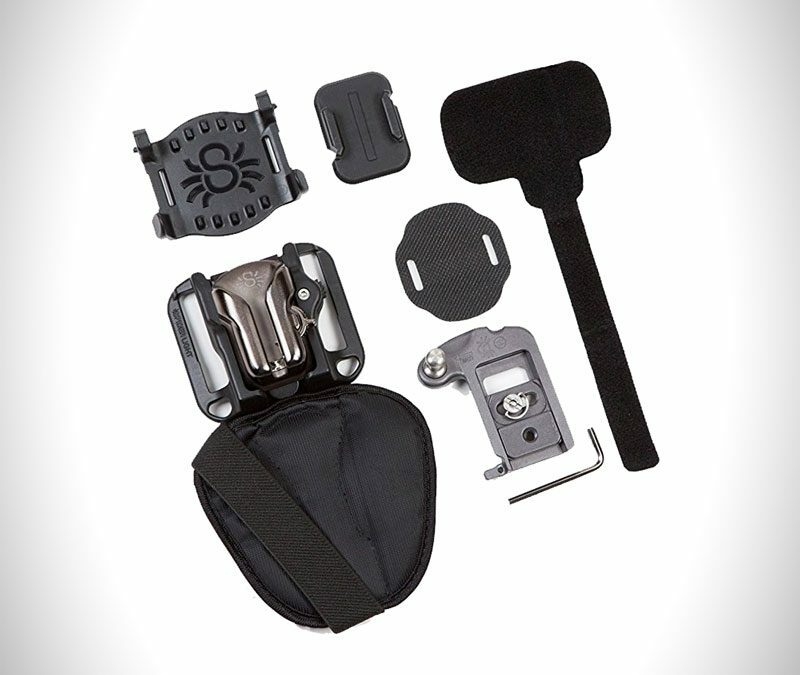 The SpiderLight Backpacker Kit camera holster is available now for around $125 USD directly from Spider. The post “Wear” Your Photography Gear Mission Impossible-style with the SpiderLight Backpacker Kit appeared first on Vagabondish.